Founders Breakfast Stout, Double Chocolate Coffee Oatmeal Stout. 60 IBU's, 8.3% abv, bottled on 19/06/11. 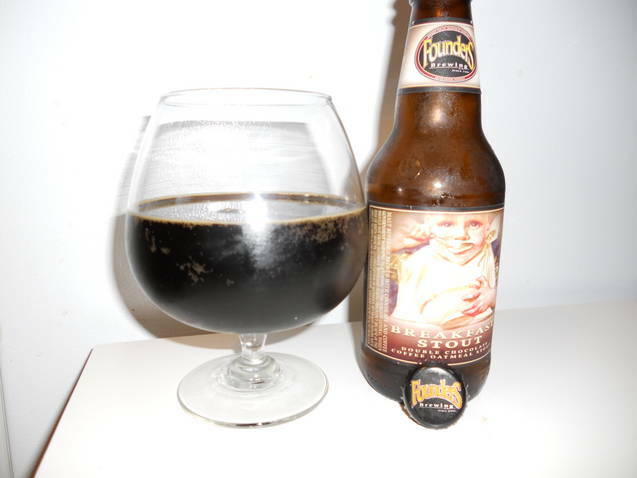 The label artwork is a baby in a bib, spoon to mouth, eating from a Founders bowl. Poured a dark black color into my snifter, but without much head. Maybe a quarter of an inch of reddish brown foam at best. The initial smell is strong on chocolate, and a little of the coffee underneath. I let the beer warm up for a couple of minutes, and took another sniff. More coffee on this whiff, a little licorice as well. A little sip and tasted the coffee upfront, followed by the dark chocolate. Very smooth brew, medium body, moderately carbonated. You get a little bitter chocolate on the finish, and virtually no hint of alcohol. Just the way I like it. Overall a very solid beer, one that I would drink again and again.